I'm completely in love with Full Frontal T.O. and I want to share this book with everyone. 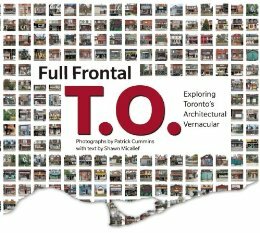 Photographer Patrick Cummins has spent more than thirty years documenting Toronto and in this book he shows (along with text by Shawn Micallef) photos of the same building over the course of decades. I find this kind of thing absolutely fascinating and I spent hours pouring over tiny details in each photo. Many of the houses and stores show the marked changes in the 80's, 90's and 2000's. For instance, a furrier in 1988 becomes a Money Mart in 2001. Some neighbourhoods slowly decay over time, others become gentrified and old buildings get a facelift. Old labelscars are revealed anew thanks to Cummins's time lens. Perhaps this book strikes a particular chord with me since it's a city I visit several times a year and it covers my entire lifetime (early 80's-present). I love how he captures both ugly and beautiful stores and buildings and somehow manages to make them all fascinating. Every picture on every page tells a story and then some - I found myself wondering about the lives of the people who lived and worked in these spaces. Some great examples from the book can be found here. If you want to lose several hours of your life in a good way almost all of his photos are stored here.